I was privileged to see and hear the veteran Polish trumpeter and composer Tomasz Stanko in concert with his latest group just after December Avenue was released at the end of March 2017. Stanko first began to make his mark in the early 1960s and is now widely recognised as one of the most significant and influential figures on the European jazz scene. He has recorded a string of notable albums for ECM in particular over the years with various quartets, quintets and a septet, always to striking effect. 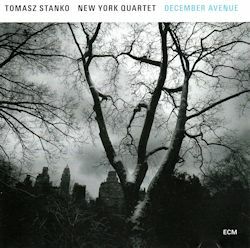 Now in his mid-70s, Stanko has been associated at various times with free jazz and avant-garde music but, for me, is most identified with a strain of lyrical melancholy which could also be found in the playing of the late Kenny Wheeler. Miles Davis has clearly been an influence. Stanko has encouraged the emergence of young musicians, too. Pianists such as Marcin Wasilewski, Alexi Tuomarita and now the Cuban David Virelles have been especially to the fore in his groups. The New York Quartet had previously recorded Wislawa, to acclaim. Reuben Rogers, who hails from the Virgin Islands, replaces Thomas Morgan on bass on this disc but pianist Virelles and American drummer, Gerald Cleaver remain in place. There are two exceptional tracks on this latest offering. Ballad For Bruno Schulz is for the Polish writer of that name, to whom the album is dedicated. It features mournful, deliberate, poignant trumpet and restrained delicacy from Virelles on piano. It's a piece of authentic beauty. Young Girl In Flower is a tender, wistful triumph of group cohesion. Not far behind for quality are Cloud and Blue Cloud, both meditative in approach, the latter more lengthy and providing scope for all in the group to shine. The title track, December Avenue, has a bustling momentum about it, with Rogers gutsy on bass and Virelles intricate on piano. Rogers is cello-like on bowed bass for The Street Of Crocodiles and Stanko makes every note count while Virelles is a measured travelling companion. The mysteriously titled Yankiels Lid has urgency and drive. Once more, Rogers excels on bass and there are lively solos on trumpet and piano. I wasn't enamoured of the group composition,Conclusion, nor with the subdued Bright Moon, and Burning Hot didn't light any fires, either. The brief bass/piano dialogues, David And Reuben and Sound Space, allowed individuals to strut their stuff but were ultimately less satisfactory than other tracks on the disc. I'm an admirer of Stanko's characteristically moody style, his compositional flair and his choice of collaborators but overall, I didn't feel this album was quite his best work. There's a certain unevenness apparent at times This most mellifluous of trumpeters, in his more oblique moments, can sound like a house fly trapped in a bottle. Nevertheless, he remains among Europe's finest and is always worth hearing. If you're familiar with his oeuvre, no further commendation will be necessary.